Pune, 30th September 2018: Priyanka Chavarkar and Chandrakant Manwadkar won the Pune 10K INTENCITY Run in a powerhouse performance in the women’s and men’s Elite Run category respectively to start off the Season II with a bang at the Balewadi Sports Complex, Pune here on Sunday. 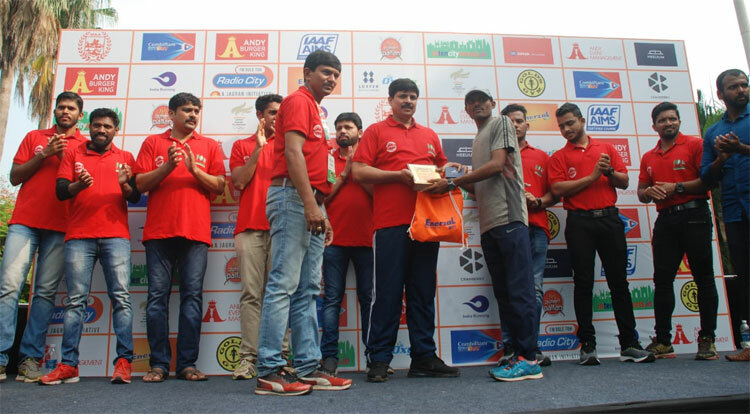 The Pune 10K INTENCITY Run bettered last year’s attendance by clocking around 4000 attendees to give a boost to the circuit run concept which had runners from various walks of life. The Elite 10km Run which is the most prestigious event of the lot went off in style with the overnight rain cooling off the city thus enabling the runners to clock better and they didn’t disappoint the eagerly waiting crowed at the finish line. Priyanka and Chandrakant who were crowned the champions crossed the finish line with impressive timings of 41:05 mins and 31:55 mins respectively, an improvement from the inaugural edition by a sound margin. Earlier, 10K INTENCITY, champion personalities from Puneri Paltan Team like Girish Ernak, and Akshay Jadhav along with Common Wealth Games medallist Krishnakumar Rane, and Open Water Swimmer Rohan More flagged off the event along with Olympian and former sprinter Anand Menezes. In the Veteran category Jui Dongre and Jaybhay Dattaray were crowned the champions. Post Pune, the event will shift to Hyderabad and is expected to take place in the city on 28th October 2018. The marathon supported by the Athletics Federation of India, Puneri Paltan and FC Pune City covers 7 different cities starting from Pune. Certified by the AIMS, the event had the runners participating in various categories in the 10 km, 5 km and 2 km runs. The 10-km stretch began from the Shree Shiv Chhatrapati Sports Complex Stadium, at 6:30 am crossing an underpass of the Mumbai-Pune Highway and on to the Balewadi Phata before returning back to culminate the run at the stadium. The 10KINTENCITY run also serves one of the core ideologies of the initiative which is to give back to sportspersons of India. Through the support of the Indian Olympians Association (An association of former Olympians), a part of the money generated will be disbursed to former and current Olympians along with aspiring sportspersons so that money can be ploughed back in creating a sound infrastructure system which will not only inspire existing sportspersons but also create future Olympians of our country. The 10K INTENCITY run which started from Pune will be followed by Hyderabad, Bengaluru, Mumbai, Chennai, and will culminate on 24th February 2019 in Kolkata. Results: Elite Women 10k: 1) Priyanka Chavarkar 41:05 min, 2) Swati Vhanwade 41:32 min 3) Nayan Kirdar 41:59. Elite Men 10k: Chandrakant Manwadkar 31:55 min 2) Dharmendra Kumar Yadav 32:00 min 3) Pralhad Ram Singh 33:17 min. 2K Future Champions Run: Boys 1) Mahadev Kumbhar 2) Prathamesh Holkar 3) Abhishek Sakhare. Girls 1) Shreeja Reddy 2) Vagisha Kumar 3) Ananya Sirki. Andy Event Management Company is Sports Management company working with some of the biggest names in the world of sports. Company’s aim is to help talented athletes achieve their athletic potential and to maximize their financial capability throughout their career. Trust, belief and passion are at the core of the company’s business. Professionalism dominates every aspect. Comprehensive services have been developed where every aspect is covered in order to optimize athletes’ performance and develop their talent. These services include competition planning and management, contract negotiations and servicing, marketing and promotion, merchandising and brand building, social media optimization, coaching, financial, legal, medical, travel, CISA and accommodation management. Andy Event Management has been involved in planning and organizing events like the Great India Run (Delhi To Mumbai run), Radio Mirchi Neon Runs. Anand has played an important role in organizing Vasai Virar Mayor Marathon, S.C. Mumbai International Marathon, Airtel Delhi Half Marathon, TCS World 10k, Tara Steel Kolkata Marathon, Spiti Valley Half Marathon 2018.